The timing couldn’t have been more awkward. When I attended American’s leadership conference last month, there was a slide that talked about how much progress the airline had made at reducing “schedule churn,” and I wanted to know more. It took some time coordinate, but a call was set for me to talk to Vasu Raja, the airline’s VP of Planning, last week. 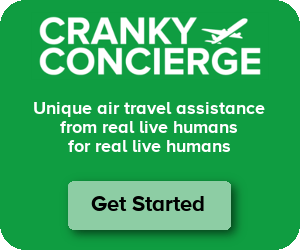 The weekend before that call, American dumped a massive schedule change with a ton of major time shifts that kept me busy scrambling to help some now-angry Cranky Concierge clients all last week. Was this really the era of reduced schedule churn? As you probably imagine, it’s far more complicated than it seems on the surface. This big change may have actually been the last of its kind, but that’s also somewhat detached from that slide I saw back in February anyway. See, the airline actually has two sets of schedules, and the slide was referring to the version that the public doesn’t see. The version the public does see? Stability has improved there as well, but even with that, you may be surprised to know that a schedule really isn’t final until 100 days before travel. And that is a big improvement. I’ll admit, I’ve struggled trying to figure out how to put this in layman’s terms. To start, we need to address that issue of the airline having two sets of schedules. There’s the selling schedule, which is what the public sees, but there’s also the operating schedule which is used to help the airline plan everything from staffing to gate availability and any other logistics required to run an airline. As you get closer to travel, these two schedules become the same. But far in advance, they differ. American and US Airways both used to handle building these schedules in different ways. For the operating schedule, American would do a continuous release about 120 days before travel. US Airways would have a release 150 days before travel and another at 100 days out to further refine it. (This isn’t a rolling schedule. These go about once a month, so it’s not exactly 150/100 days.) When you combine that different way of handling scheduling with all the moving parts in a merger, the process of scheduling became pure chaos. Remember the LAX operational mess in the summer of 2016? American was still changing schedules in late spring, and the ops team at the airline had to scramble to try to support those frantic changes. It didn’t go well. You can layer on top of that the problem of a quickly-changing fleet. American has been adding new airplanes like crazy while it retires older ones. Schedules were simply a nightmare to construct. In fact, I have a photo of what I’m told was the scheduling team handing off an operating schedule to the ops team back in 2016. As the airline moved toward a release schedule similar to that of US Airways, it found that about half of its flights would change about 150 days before departure. And another 10 percent would change within 60 to 90 days out. That is way too close in for planning, so after much work, by January of 2017 the airline had smoothed that out dramatically so that it could present a more accurate and viable schedule to operations every time. On the selling schedule side, all this chaos wasn’t helpful to giving customers faith that the flights they had ticketed were still going to operate. The operating schedule was delivered and revised before the public ever saw it, but when the operating schedule is changing 60 to 90 days out, every change had to be pushed right into the selling schedule with such little time to spare. Sure, people expect there to be schedule changes in advance of travel, but they should mostly be relatively minor tweaks, and that wasn’t always the case. This constant upheaval was causing big problems for travelers, and this was happening close enough to departure that people found themselves stuck without a good option. In other words, what American had published for this summer before that schedule change was simply not possible to operate. That is a frustrating thought for people who plan entire trips around this idea of stable airline schedules. But with the big change done, merger activities winding down, and fleet type replacement slowing, it should become more stable. Here’s how things will go down in the future. American begins selling tickets 330 days before travel. Today is March 12, so that means you can buy a ticket for travel on February 5, 2019. Tomorrow you can buy a ticket for February 6, so it’s just a rolling schedule. But the schedule you see is merely a skeleton. That skeleton was far less accurate in the past because of the reasons mentioned above – out-dated base schedules, the merger, shifting fleets, route changes, etc. Going forward, it should be more stable, but it’s still going to be a placeholder that can change. At 150 days before travel, American will submit a proposed schedule to the operations team to review and use for planning purposes. At that time, American will also publicly push out any major change it knows about, but none of the smaller ones. That includes new markets and canceled routes. It should include things like holiday cancellations so that people have a little more time to adjust plans during those times. Keep in mind, this isn’t a rolling 150 days as is the case at 330 days. American now plans 11 schedule releases a year, so it should cover a time of roughly 150 to 180 days out. Between 150 and 100 days, Vasu’s team will work with the operations team to address any issues and refine the schedule. It will also make minor adjustments to schedules to account for seasonal block time changes and airport congestion issues. Those are all those annoying changes you see where times move a few minutes either way. In that 100 to 110 day range, American will publish its schedule publicly. According to Vasu we should only see 8 to 10 percent of schedules change, but only at that point can you consider the schedule to be somewhat final. Travelers who book more than 100 days out, well, be prepared for possible change. It’s true that travelers can use this to their advantage. Book the cheapest flight you can find around when you want to travel, and then when the schedule change occurs, you can move to your preferred flight even if it was pricier. But as Vasu explains it, even this will become more of a gamble in the future with fewer schedule changes occurring, and those that do will happen earlier than before. I’m curious to hear how this is done at other airlnes. Fascinating; thanks for posting. One question that I’m curious if Vasu address – where does the fare pricing come into play? Is their revenue management team setting fares against this skeleton schedule? Seems like it would be difficult to properly yield manage. what you see is that there isn’t a lot of fluctuation in fares that far out. Aside from big events/holidays/etc. the fares sit at a consistent level across multiple flights or days of week, or perhaps standard adders or subtractors to some average. It typically is not the lowest fare. Because very few people book that far out, not much yield management to do. It is not worth giving away the cheapest fares to someone who is “locked in” to a date so far out, nor can you really stimulate much unless you give away all your profit. It is why for most travel, booking that far out isn’t usually the cheapest — cheaper fares come in the 90 day range when they start to seriously look at trends, competitors, inventory, etc. Chris – RM is a big problem, actually, and it was a driver for getting a better schedule process together. At least, Vasu did note that RM was an issue. As noted by others, there isn’t really any significant RM work going on for these flights. That happens closer to departure. But the problem came when they would, say, cut a frequency and then have to scatter existing bookings to other flights. Or it created misconnects, so people had to be moved. All the shifting made for some bad data that does make the job of RM harder. Something I don’t understand, with many questions… In the beginning of the post, you refer to a massive schedule change with many time shifts that angered clients. Were those changes for imminent travel, or for travel 100 days out? Changes to schedules for next week or even next month, I know can upset people. But, as you say, people who book far out should expect changes. So, if the changes were for imminent travel (and not weather related), why? And if they were for 100+ days out, why were the new schedules so unmanageable to provoke the anger you describe? And finally, even if flights are cancelled or routes dropped, isn’t 100 days enough for the airline’s systems to construct a reasonable alternative? When AA made its changes, sometimes the nearest flights were 3 hours before and after. That meant no viable or very difficult times. And for the Orlando trip, we were meeting others and going to a theme park where the change would really affect the activities (some of which had to be booked 6 months out). So, having this happen to all 3 family trips was pretty frustrating. With Orlando we ended up canceling and rebooking on Southwest, but it was more expensive since it was much closer to the date than when we booked on AA. For the others we just have to deal with a harder trip. Benjamin – These were for about 100 days out, but the changes were pretty obnoxious for many. For example, one person was flying from St Louis to Venice via Chicago. The St Louis – Chicago schedule changed so that instead of 1h40m connection, it ballooned to 5h20m. There was a better connection (2h6m) via Philly, but this person had paid for and needed Main Cabin Extra due to height and that aircraft from Philly didn’t have it. Some went the other way. For example, someone was flying Budapest to Knoxville via Philly. The Knoxville flight moved up so that the only connection is now 1h49m. That’s pretty short considering you have to go through customs and immigration, but there are no other single stop connections. There were plenty more. The problem is that the schedules this time changed dramatically. Normal shifts aren’t as big of a deal when it’s a few minutes here or there. Do you have any sense–overall, big picture–what fraction of seats is sold > 100 days out? American was explicit about this when they did the switchover to put both US and AA on the same reservations system. Less than 10% of tickets they sell are for more than 90 days out. Setting up schedules, like do people really book a hundred days out? Why? What is the consumer to gain over, say 30 days? And for the airlines, why does someone like UA believe it should try to set up schedules that operate daily, while someone like WN doesn’t, instead having separate sets for weekdays and weekends? And, does contracting out flight operations to regionals make setting up schedules easier, or more difficult? Like, comparing UA with WN? Questions, questions, like your “Ask Cranky” bin isn’t full enough? I’ve occasionally booked over 100 days out, but only for a non-flexible date when a very good sale fare dropped. I usually “start” to look for Christmas season fares in August or so, and feel anxious if I have nothing booked by the time October hits. For fares during high season times (like Christmas/year-end holidays), I will pull the trigger as soon as I find nonstop flights with reasonable times for ~$300 RT or less (this on a city pair that is usually ~$200 RT minimum during the low season). Could I save a few bucks if I wait to book later? Perhaps, but it’s not worth the risk when I know the flights will sell out. For other leisure trips I tend to be much more flexible around timing, and the trips aren’t usually “must go” trips like seeing family for the holidays, so while I will usually book a month or two out I’ll try flexible dates or play the waiting game some if I’m a little undecided on taking the trip. Jaybru – For international flights, people commonly book further in advance than for domestic. But when it comes to holidays, people like to book early, same for vacations that are set in stone already. It’s not a huge percentage of the total that book outside of 100 days, but it certainly happens. Some of it is solely due to the myth that you get the cheapest fare when tickets first go on sale, which isn’t true. As for scheduling, most airlines vary their schedule every day. Southwest was the exception because it didn’t have the tech to do it. Now it does, but it’s been slow to tackle the change. I can fully sympathize with American’s problem. It must be a nightmare with all of those variables. When I was responsible for schedules at Aloha they were fairly stable and our fleet was small. But still there were maintenance requirements, crew contract requirements, station staffing, curfews and competitive tweaks to consider with each schedule. And each change to one potentially affected the others, but especially the poor Ops folks. It completely boggles my mind to imagine trying to do Vasu Raja’s job. My flights to STL were fiddled with and was bumped out of an MD-80 on one of the two flights into a 737-800. A little sad, but not a major time shift. I find it amusing that when you want to change your flight no matter how far out, it is $200, when they change your scheduled flight you get nothing but a nasty AA reservation agent? With most US carriers, if they change your flight by a significant time (typically an hour) then you have the right to change to any other flight that day free of charge, or cancel for a full refund. I’d be curious if these guidelines applied to the American Eagle schedule as well. It seems like AA* still has a significant amount of aircraft changes more like 75-90 days out. Dale – They should be treated the same. This stuff fascinates me. I am thrilled the Brett breaks it down for us in easy-to-understand pieces. I live the illustration too! Cranky – Can you please clarify the “continuous release” term used in the section labeled “The Operating Schedule for Planning Purposes”? Do you mean rolling, day by day, or something else? James – I’m afraid I didn’t get into any more detail on that since it was the old process that’s not used anymore. My assumption is that it wasn’t quite rolling every day but maybe on a weekly basis or something like that. Either way, it was more continuous than what they’ve settled on. This is a very informative post. Thank you Cranky! DP: Today AA notified me of changes to 2 of my domestic flights for mid- to late-August. These were the small, 10 to 35 minute type of changes. One of them is going to require (at best) a sprint at DFW to arrive during my group’s boarding for the next flight. I don’t know if it’s a combination of this font and my tired eyes, but I kept reading “schedule churn” as “schedule chum”, and picturing Ops getting handed a bucket of fish guts. Appropriate?